The early morning light filtered in through the blinds as Axel laced up his boots. Persephone lay sleeping in her bed nearby. She looked so peaceful, so he didn’t want to disrupt her slumber. Moving quietly, the mercenary stood up to search for his shirt, which had been hastily discarded the night before. Axel turned around to see Persephone gazing at him from the bed. Persephone stood up, then walked over to Axel and planted a kiss on his lips. “I’m all ready to go,” Gaster replied, emerging from his room. Glancing over at his crewmate, Axel saw the former smuggler wearing a brand new trench coat. “Nice coat,” the mercenary complimented him. “If you wanted protection, you should’ve had Erik make you some armor like mine,” Axel said. “I’d rather have my mobility unimpeded,” Gaster said. The mid-morning sun was shining brightly as Axel, Cyrus, and Gaster made their way through the bustling streets of Greywall. Following Gaster to the location he had scouted the day before, Axel looked around and the flowing crowds. The former smuggler had led him and the captain to a busy part of town Axel couldn’t help but feel a bit surprised by how busy it actually was. As far as small Outer Rim port towns went, Greywall was certainly was one of the busiest the mercenary had visited. “This is the place,” Gaster said suddenly, stopping outside an unmarked and seemingly abandoned building. “Right behind you, boss,” Axel said as he followed the captain. Entering the building, the trio stepped into a room full of tables and chairs. A large screen adorned the far wall and a group of four people sat around one of the tables. They all looked over at the Maverick crew as they moved into the room. Judging from their rugged appearance, Axel assumed they were mercenaries, likely from the Alliance if the cowboy hats worn by two of them were anything to go by. A moment of silence passed as the two groups looked at each other, neither saying anything to the other. Finally, after what seemed an uncomfortably long time, Gaster dared to speak. “So are we,” one of the mercenaries said, his Alliance Outer Colony accent rather apparent. He was a young, dark haired man, perhaps in his mid twenties and he wore a long coat and a rather nice looking cowboy hat. “So where’s our prospective employer?” Axel asked, taking a step toward the man. As these mercenaries didn’t seem to know anything about the job, Axel shifted gears and decided to make small talk, hoping to learn more about them. “That’s a cool hat you have there,” he said. “Thank you,” the man said, tipping his hat at the mercenary. Axel then turned away and walked over to the giant screen on the wall. “This sure is a fancy looking screen here,” he said. “Ain’t it?” one of the other mercenaries said, his Outer Colony accent much thicker than the other guy’s. This man looked a bit younger than the first. His shaggy brown hair was longer than his companion and his face was covered in facial scruff. He wore an old, somewhat tattered cowboy hat and no shirt. A thin trail of smoke rose from the lit cigar in his hand. “Uh, nice pecs there, guy with no shirt on,” Axel commented with a hint of sarcasm. The man nodded and brought his cigar up to his mouth. As this shirtless man inhaled a puff of smoke from his cigar, Axel noticed the man beside him — a guy with a scraggly horseshoe mustache and prominent sideburns who wore a grease-stained baseball cap and looked to be in his early thirties — wore a vest full of explosives. Classy, Axel thought as he took a step back, recognizing the potential danger of holding a lit cigar so close to combustion-based explosives. “So who are you guys, if I may ask?” the first man asked. Turning back to him, Axel began walking back over in his direction. “We’re just some travelers looking for some work,” he said. “I can see that,” Lars said, glancing at the mercenary’s flamethrower rig. “And this is the captain,” Axel said motioning at Cyrus. “Cyrus Drake,” the captain introduced himself. “And that’s Gaster,” he added, pointing out their crewmate, who was hanging back a bit. “A pleasure to meet you,” the former smuggler said with a nod. “Can’t say I’ve heard that name before,” Axel said. Lars let out a chuckle. “The very same,” he said. “This here is Floyd,” the bounty hunter continued, nodding at the shirtless man. “Howdy there,” he said between puffs of his cigar. “And Jim Bob,” Lars said, glancing at the man with the explosives. “And that there is Bobbie Jo,” Lars finished, pointing out the fourth member of his team. She was a tall, muscular woman with short blonde hair. A large heavy-duty grenade launcher lay across her lap and she wore an intimidating scowl on her face. She was definitely someone Axel wouldn’t want to mess with. “So, where y’all from?” Floyd asked. Before anyone could answer the question, the doors slid open, revealing four figures silhouetted by the light pouring in behind them. These newcomers stepped inside the room, each striking a pose as the door slid shut. With the light out of his eyes, Axel got a good look at this group of people. Each of the four was dressed in a stylish, color-coordinated outfit and gave off the impression of a bona fide badass. They were clearly yet another team of mercenaries or bounty hunters, and they looked like serious professionals. At the front of this team stood a tall, voluptuous woman with a piercing, icy gaze and long platinum blonde hair pulled into a braid that hung over her left shoulder. She wore a shimmery deep purple top that showed off her ample bosoms and a long, fashionable black coat with a purple lining. Just looking at her, Axel could tell she was the leader. The blonde woman was flanked on either side by a dour-faced man with jet black hair and a short and petite woman with brunette hair dyed with streaks of pink and purple. The man’s hair was slicked back and was dressed all in black, including a long leather trench coat with subtle purple accents. The woman had a sly smirk on her face and wore a cute white coat with pink and purple accents. Towering over all three of his companions, the final member of the team was a huge, muscular man with close-cropped dark hair. His imposing form loomed behind his teammates. He wore dark pants with a purple belt and a tight sleeveless shirt that stretched across his bulging muscles, revealing his hulking biceps. Aside from his impressive physique, the most notable thing about this man was the advanced-looking cybernetic limb that replaced his right arm, beginning just above the elbow. “Damn, we should’ve brought one more person,” Axel mumbled to himself, noting the fact that he and his two crewmates were the only group to show up that didn’t have four members. Cyrus chuckled at this and shook his head. Paying his employer no mind, Axel strolled up to the newcomers. “You guys look like you know what you’re doing.” The mercenary was met with a cold stare from the leader of the stylish team of mercs. “If it’s not rude to ask, what happened to your arm there, friend?” Axel then asked, approaching the muscular man. The man scowled back at him. “Vorkout injury,” the muscular man said, a thick German accent quite apparent. “So are you here for the job or giving us the job?” Gaster inquired. Axel frowned. “Well that was rude,” he said. “Y’all are a buncha a-holes,” Floyd called out from across the room. The blonde woman scowled as she gazed across the room at everyone. “That may be,” she said. “But fowl scoundrels such as yourselves are not worthy of the respect of an elite team of bounty hunters such as ourselves.” She then took a step forward, with the rest of her team close behind. As Axel moved to confront the disrespectful bounty hunters, the screen at the far end of the room flashed on, drawing the attention of everyone present. Deciding to let the slight against him go for the moment, Axel approached the screen with everyone else. “And who, exactly, is this target?” Lars inquired. Axel had never been to the planet, but he certainly recognized the name of one of the Romanov Union’s major economic hubs. The fact that they were being asked to capture the governor of such an important planet seemed a bit suspicious to the mercenary. “Is this perfectly legal?” he asked. “Not entirely,” the man in the hat said. Axel shrugged. “Fair enough,” he said. This man clearly knew more about the governor than he did. “Might I ask who you are?” Gaster asked. This time it was Gaster who shrugged. “Fair enough,” the former smuggler said. “So what about our payment for this job?” Axel asked. Axel’s jaw dropped. “That’s a lot of money,” the mercenary said. The thought of making that much money from one job was tantalizing to say the least. “Don’t you think we’re going to get in each other’s way a little bit?” Gaster asked, glancing around the room at the two teams of bounty hunters. “That is up to you,” the man on the screen said. “You can work together and split the payment if you so choose. All that matters to my employer is that you bring Mr. Yong back alive.” He paused and looked around at everyone. “Any questions?” he asked after a few moments. “Sounds good to me,” Axel said. “Any other questions?” the man in the hat asked, looking around at everyone. “No? Okay, good. Get moving.” With that, the screen went blank. “We don’t need luck,” the blonde woman scoffed. “You should save it for yourself. You’re gonna need it.” With a flourish, she turned and moved toward the exit, he coat fluttering behind her. The rest of her team followed her, departing in an equally dramatic fashion. The man in the leather coat looked glanded back with a taunting sneer on his face before walking out the door. “You can say that again,” Gaster agreed. “I’m not really comfortable with this job, Captain,” Gaster said, looking across the table at Cyrus. “Yeah, but one-point-two-million credits,” Axel interjected. Cyrus let out a sigh. “It’s a tough decision,” he said. “You got it,” Gaster said, nodding. “That and the whole thing seems a bit shady if you ask me,” Gaster added. “It certainly sounds like it,” Taraka said. “We just need to make sure we get there first,” Axel said. Axel sat in the pilot’s seat in the Maverick’s cockpit, gazing out the front viewport at the glowing energies surrounding the ship as it flew through warp space, en route to Troyva. Tsumugi, his ice variant Ninetales from Freyeon, lay curled up in the co-pilot’s seat next to him. The mercenary stroked the Pokemon’s soft fur as he thought about the upcoming job. “Get outta my seat,” Axel suddenly heard Anya’s voice say. The mercenary turned to see the ship’s pilot standing in the entrance. “But I’m comfortable,” the he replied. Axel’s statement was met with an eye roll. “Fiiine,” Axel responded, hopping to his feet. “I’ll sit over here” He moved over to the seat behind the one his Ninetales was occupying. “Thank you,” Anya said as she sat down in her seat. She reached over and petted Tsumugi before she started fiddling with the console, preparing the Maverick for its arrival at Troyva. “So what do you know about this Mikhail Yong guy?” Axel asked. As the only Romanov member of the crew, if anyone would know anything about their target it would be her. “Well, he’s part of the Yong Family and the governor of Troyva so he’s kind of a big deal,” the pilot explained. “So then the rumours are true?” Axel asked. “I’m more worried about figuring out how we’re going to grab this guy,” Gaster’s voice sounded from behind them. Axel glanced back to see the former smuggler stepping onto the bridge with the captain just behind him. “Well, we know when and where,” Cyrus said. “Do you think it’s possible to impersonate the people he’s meeting with?” Gaster asked. The captain responded with a question of his own.“How’s your Romanov?” he asked, a slight smirk on his face. “How about we just go guns blazing, crash the meeting and get there before the other teams do?” Axel suggested. “I hate to agree with Axel, but he’s right,” Cyrus said. The smell of salty ocean water and industrial waste hung in the air as Axel, Cyrus, Gaster, and Taraka made their way through Zolotaya Old Harbour District. This part of Troyva’s capital had once been a major seaport for shipping goods in and out of the city, but with the advent of modern space lanes it had become obsolete. The areas of the old harbour that hadn’t been absorbed by the expanding spaceport had been built over with new industrial zones. “The warehouse we’re looking for should be around here somewhere,” Cyrus said as the group rounded a corner. Looking ahead, Axel saw a large industrial park full of warehouses sprawling out before them. Beyond that, the mercenary could see the famed golden skyline of Zolotaya in the distance. “I think that’s our target there,” Gaster said, pointing out a fancy looking skycar touching down. The original plan had been to intercept the governor in transit, but now that was no longer an option. Ace and Kasey were waiting back on the Maverick on standby in case the team hit a snafu, but Axel didn’t think they needed their help just yet. “What’s the plan then, Captain?” Axel asked, glancing over at Cyrus. “Well we don’t want to be seen just yet,” Cyrus said. “We can use our Pokemon to get us over the fence and we can come up through that alleyway there,” the captain said, motioning toward a narrow passage between two warehouses near the fence. A few minutes later, with the help of Axel’s Gyarados and Taraka’s Tangrowth, the team had scaled the fence and were moving up through the alley. Navigating between several warehouses, they managed to remain undetected as they followed the governor and the two armed guards accompanying him as they walked down the main path used for industrial vehicles. Relying on Cyrus’s Talonflame to keep track of the governor’s position, they were able to stay at a good distance. Eventually, the team arrived at an open area behind several warehouses through another narrow alleyway. Peering around the corner, Axel got a good view of the governor his two rifle-wielding guards as well as the backs of the men he was meeting with. There were three of them, all armed, and they were clearly gangsters of some sort. Axel attempted to listen in on their conversation, but he couldn’t make anything out as they were speaking in Romanov. “That’s pretty obvious,” Taraka responded. Suddenly, Axel heard a low rumbling sound, but he couldn’t tell where it was coming from. “Do you hear that?” the mercenary asked his crewmates. Before anyone got the chance to answer, a Steelix erupted forth from the ground behind the governor. Four figures jumped down from the gigantic Pokemon and landed in dramatic poses. Notes: Here we are. Session 32. This was a fun session that kicked off a multi-session plot arc. This chapter, however, only covers the first part of this session. 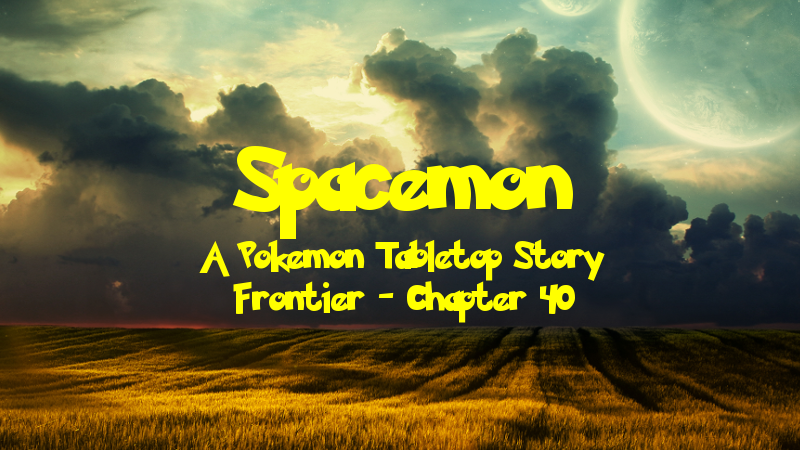 I pushed the later half of the session to the next chapter for pacing reasons. To start things off I added an extra scene at the start of the chapter to resolve the end of the previous chapter. This is just a little something to show the readers how Axel’s relationship with Persephone is developing. Then it was time to give the party an interesting job. DragonStorm and I came up with a cool job idea before the previous session, but the plan was for them to take on the Fire Gym first, so I gave them the lead on the job before the gym and set it up so they would meet with the employer the following session. That’s not all we came up with either. DragonStorm had pitched the idea for a team of rivals for the crew and we came up with Team Vogue! We wanted to throw a friendlier team at them too, and I had been wanting to introduce the character of Lars, whom you may recognize if you’ve read the original series, into the plot for a while, so I gave him a team of fellow space rednecks to be a proto Red Suns of sorts. They were fun to come up with. Novi had to miss the beginning part of the session, which is why Taraka is absent from the first few scenes, but he arrived in time to be informed of what was going on before the job started. There was some good RP this session too, with the planning for the the mission happening almost entirely in character. I was so proud of them. The scene between Axel and Anya happened naturally too and I got to provide them some more details through her. I expanded it a bit for the writing so provide some more context for the readers. I’m happy how it turned out. Unfortunately, Alec had to miss this session, which is why Kasey stayed on the ship when they got to Troyva. I added some more details of them going to the location of the meeting just to make things more interesting. Funnily enough, the session ended up ending on a cliffhanger, just not the one I ended this chapter with. Look forward to some fun combat in the next one! Thanks to DragonStorm for helping write parts of this chapter. Post-Chapter Challenge: We haven’t had one of these since I resumed posting, so let’s get to it. Come up with an interesting job! You’re someone in the Spacemon universe that needs something done and you need to hire a party, or a team of bounty hunter, or whatever to get it done. Who are you? What’s the job you need done? Who do you want to hire? I look forward to seeing what you come up with! Perhaps I’ll use it for a future Spacemon campaign or one-off writing piece.